Some days it can truly seem like madness. We ride the ever-circulating merry-go-round of life which is filled with working, earning, spending, repeat, work, earn, spend. More and more these days it seems like people are working long hours to earn more money. Money that is then, spent on processed convenience food items because they are too busy working, to prepare or grow their own food … It makes no sense to me and it certainly doesn’t make any cents. All of the food items below cost about $4 or $5 each, to purchase. Some of us purchase more than one of these items daily. That adds up to many dollars per week, just in potato products. How many hours of paid work does it take, to enable us to purchase those items? 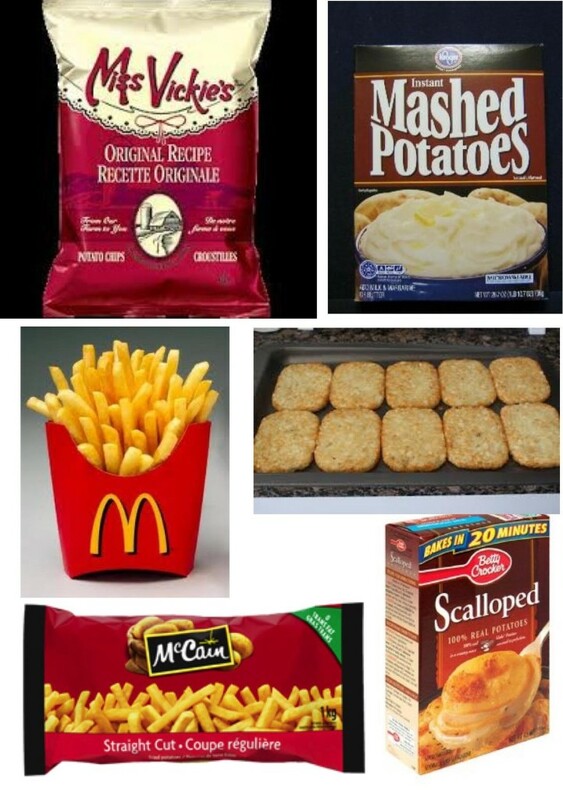 How do processed potato products contribute to our health and well-being? 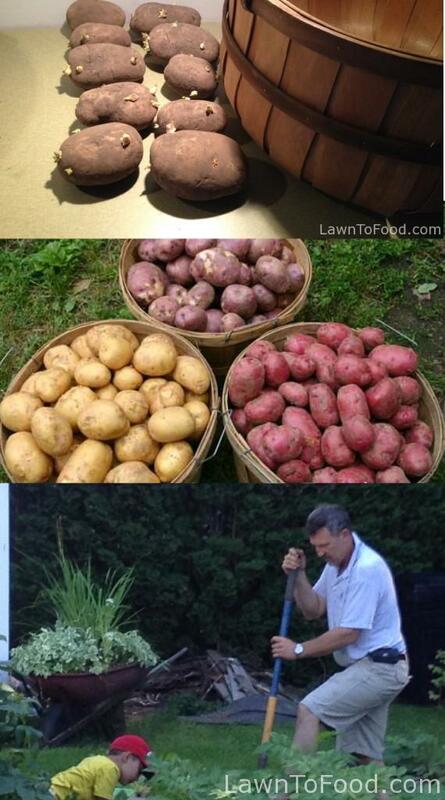 A smarter, and more fulfilling, option is for us to purchase with our $5, a bag of certified seed potatoes. 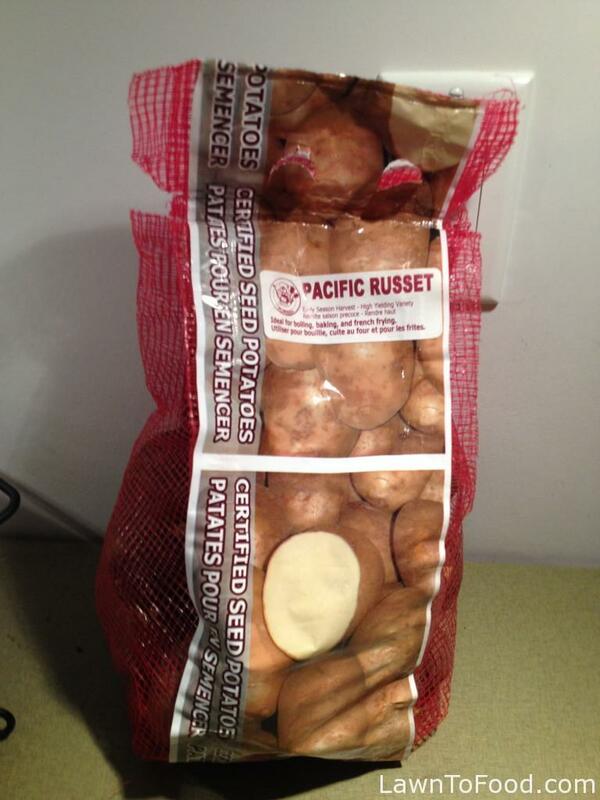 Each bag contains at least 10 potatoes that are ready to sprout into action. Each seed potato can be cut into 2 or more portions, creating 20 to 30 potato plants! From each potato plant that grows, we can expect 8 to 12 different sized potatoes. That is a possible yield of 360 spuds from one $5 bag of seed potatoes!! That’s a lot of potato cents, not mention the health benefits gained from eating our own fresh, organic harvest. Lets do it !! … Get outside, de-stress, grow some food, work less and make cents. Wash them off with the garden hose and then spray Grandpa. Boil skin-on potatoes until a fork goes in easily. Drain and let them cool. Pick herbs from the garden ~ dill, parsley, thyme, chives. Pick 1 carrot and 2 green onions. Chop all the vegetables and herbs. Add 2-4 TB of olive oil, squeeze 1/2 lemon, lemon zest, pinch of salt & pepper. Mix everything all together and serve. This entry was posted in Containers & Small Spaces, Crop Planning, Fresh Vegetable Ideas, Gardening w/ Kids, Growing Food, Let's Eat, Reep the Harvest and tagged budget, food, groceries, potato salad recipe, potatoes by Lynda. Bookmark the permalink.